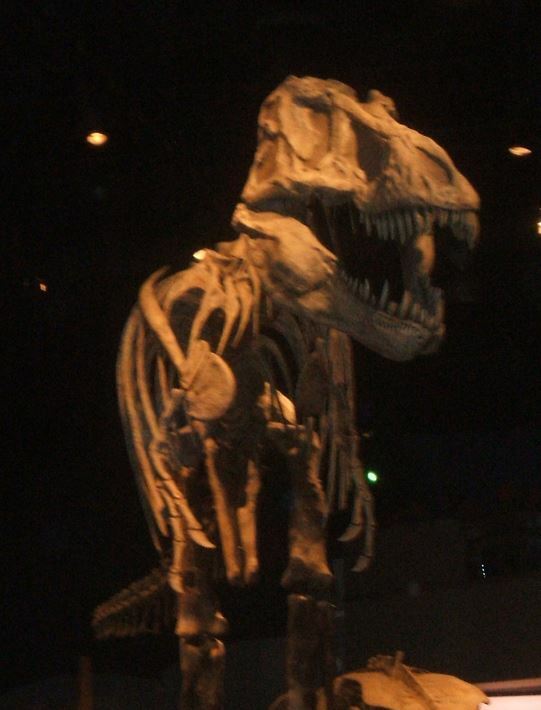 If you spend a little time at your favourite dinosaur museum, you are sure to hear parents explain to their child that the T-rex about to swallow the kid’s head is just a bunch of dead bones. “Quit bawling, Johnny. It won’t eat you, it’s just bones. Now settle down while I take your picture.” I always delight in telling such folks that these are not bones, they are stones. They have as much relationship to bones as Rodin’s Thinker has to a contemplative Richard Dawkins. Similar shape. One is the original; the other was made from a mold. Fossils are rocks. They may start out as bones. Some might argue that bones are rocks even when they are still covered with flesh, but that’s not quite true. Bones are mostly made of flexible strings of proteins called collagen. Attached to that pliable framework are the rocky minerals calcium phosphate and calcium carbonate. Calcium gives bones their strength. It also builds reefs, which create limestone and marble. Bones are not quite rock hard, but close enough. However, fossils are not bones. Fossil bones are actually stones. At least for fossils of those dead animals that once had bones. However, bones are actually relatively new body parts. For most of its existence, the Earth hosted non-boney lifeforms. Scientists crave details about the lives and habits of those early boneless creatures. 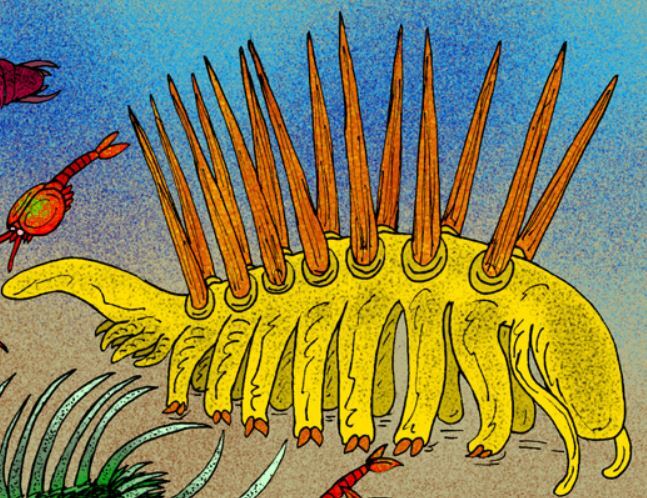 These animals existed for hundreds of millions of years, predating dinosaurs and humans by eons. They were around for a ridiculously long interval. The amount of time from the last dinosaur to the most recent human is far less than the time that pre-boned animals filled the Earth’s environment. For two billion years, nothing more complicated than tedious uninteresting unicellular life existed on the Earth. Then, about five hundred million years ago, an incredible transformation erupted. Everything changed. In under ten million years, life on Earth went from single-celled biochemical slime to a full spectrum of diverse and complicated creatures. The trigger for the sudden unprecedented arrival of things like arthropods, worms, and figmentasias is unknown. We have a gap in our knowledge. Suffice to say, the event known as the Cambrian Explosion (an eruption of living diversity) is being probed with intense research and speculation. The paucity of fossils of the soft-tissue Cambrian animals makes the mystery difficult to resolve. In a geological blink, life evolved from gooey simpleness to puppy-sized carnivorous arthropods. But we don’t have enough fossils to piece together the entire transition. They were bigger than algae and much more complex, but the new pre-vertebrates had juicy bodies that melted away upon death, rarely leaving evidence of their existence. It takes extremely unusual circumstances to preserve the outlines of dead, squishy creatures. Soft animal fossils are found in just a few places. The soft tissues need to be gently enveloped by mud and clay. The mud is then overlain with more mud or heavier sediments, erecting a shale tomb for our beloved ancestors. Inside the tomb, there has been no mineralized replacement of the gelatinous organs, but there are occasional outlines and impressions, much as your fingers might make by squeezing Play-Doh. In the case of Cambrianites, the envelope is made of very old rocks. Not only are the conditions of proper entombment rare, but because of the age of the rocks, they have had a much longer time to tectonically lift above sea level and erode, leaving dust in place of marvelous imprints of animals such as Polychaete worms, Molaria, and the exquisite Marella. 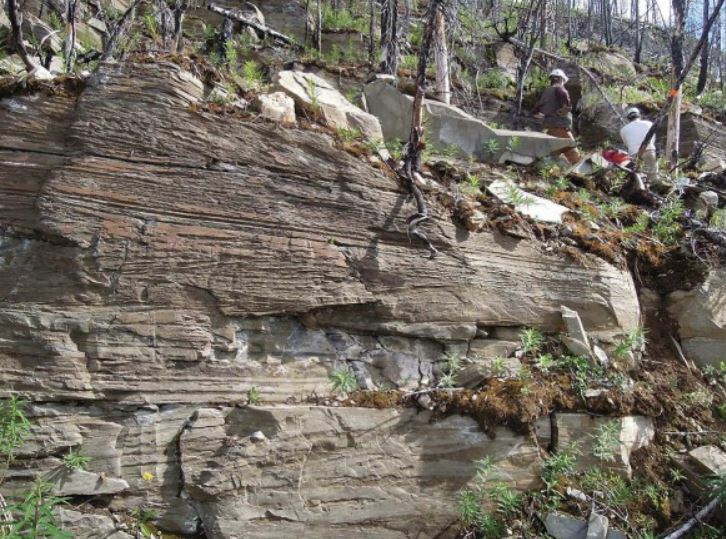 The tectonic forces that lift Cambrian rocks to sunlight are still active today in Canada’s Rockies where shale containing the rare fossil imprints of soft animals are exposed to the destructive vigor of wind, rain, and geologists. 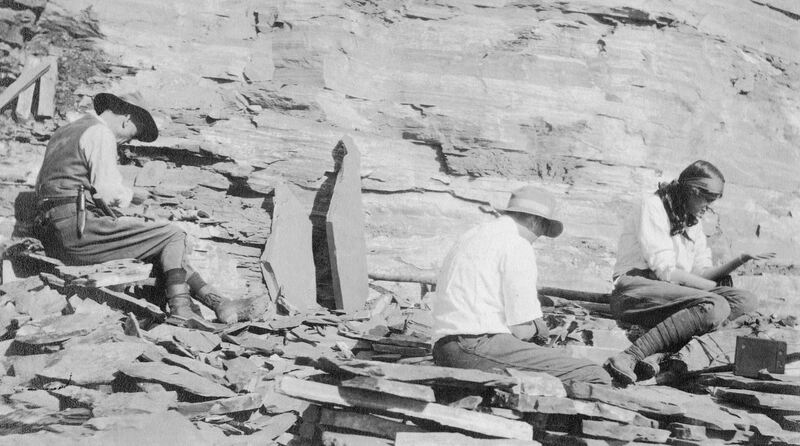 Until two years ago, the last truly great discovery of a Cambrian-age fossil assemblage was found by Charles Walcott in 1909, at a place we call the Burgess Shale. The fine-grained rocks of the Burgess preserve the world’s best Cambrian fossils. About 505 million years ago, when these particular creatures lived, North America was visiting the equator, the sea was warm, and marine plants and animals thrived. (By the way, the continents were completely lifeless, all the planet’s biology was in the oceans.) At the time, the squishy creatures were competing to capture prey, while avoiding becoming a dinner snack, while racing away from mud slides, while looking for suitable mates. These were likely the stresses that helped evolve the conservative life forms into creatures which could eventually blog about their ancestors. But what was the trigger? What started all this in motion? Charles Walcott, his wife, and son, digging M. walcotti from the Burgess Shale’s Walcott Quarry, 1913. We are not likely to solve the Cambrian explosion mystery with just the soft-tissue patterns pressed into the original Burgess Shale Walcott Quarry. Although many diverse species have been described since this discovery a hundred years ago, the UNESCO World Heritage site has likely yielded the bulk of its astonishments. We now know much about the ecology and habits of the Burgess denizens. They have been examined and re-examined, especially during the last thirty years. But just when the work was drifting towards monotony, an amazing thing happened. A whole new fossil field was discovered about forty kilometres away. 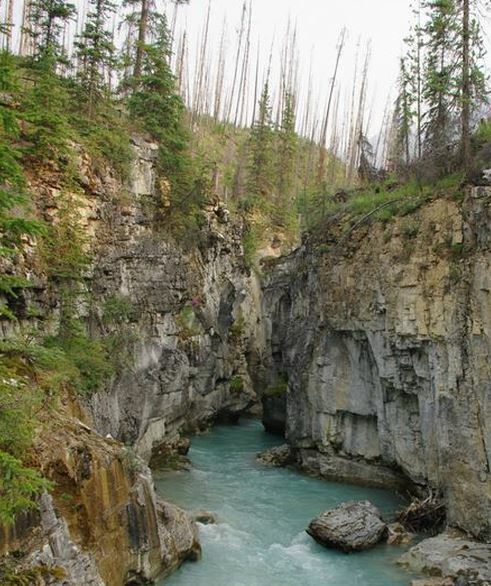 Marble Canyon, with a hiking trail connected to the Kootenay Highway that links Calgary and Radium Hot Springs, would not seem the place to find a whole new batch of enigmatic Cambrian creatures. I have tramped the trail around the fake marble cliffs several times. (Marble Canyon is made of shiny limestone.) While oohing at the dramatic narrow canyon (a few metres wide at top, plunging 20 metres to the stream below), I missed noticing Cambrian fossils. Nothing to feel too embarrassed about – for a hundred years, everyone missed seeing the fossils. They were discovered in 2012. And to be even more fair to myself, the location of the new Cambrian fossils is not in the canyon. Instead, the fossils are being sliced out of shale somewhere a couple of kilometres from the lovely gorge, at a secret location on a mountain cliff. The Marble Canyon fossils are important. Their host rock is a continuation of the same Burgess Shale formation found to the northwest. 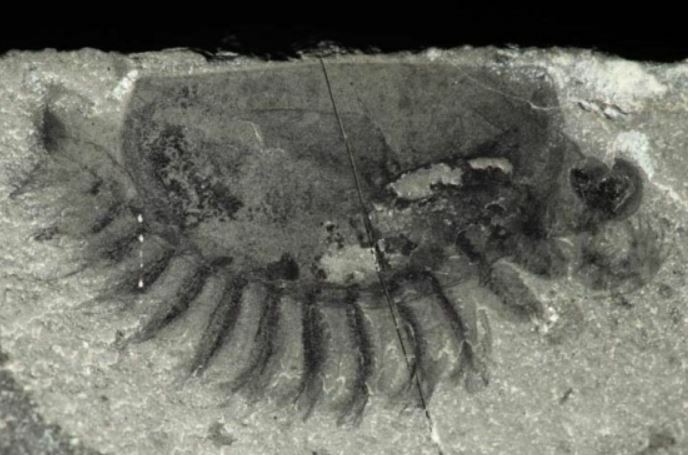 But the new discovery is far enough from the early fossil bed to have fostered a local, unique microenvironment with somewhat different creatures than those at the 100-year-old Burgess Shale discovery. Here, near Marble Canyon Trail, cousins of the older Burgess Shale site also thrived. In addition, an astounding 22% of the species just unearthed at Marble Canyon had never before been known to science. Although arthropods are well-represented at Marble Canyon, along with some animals that look like nothing now living on the planet, there was also an experimental fish. A proto-fish called Metaspriggina. The minnow-sized ichthys is one of the oldest fish ever found and is particularly notable because of signs that it had a jaw. Perhaps the first jaw ever found anywhere, filling a missing link in the evolution of vertebrates. Until the Marble Canyon fossils were found, the only two other samples of this cartilaginous fish were not complete enough to reveal the jaw. With Marble Canyon, 44 more samples are now known and the simple jaw is definitely present. Not only were the Cambrian dwellers of Marble Canyon exercising their right to evolve past primordial slime, they were on their way to becoming creatures with jaws and backbones. Fittingly, the team included Gabriela Mángano, a geology professor and ichthyologist from my own alma mater, the University of Saskatchewan. It is her picture of the dig that I’ve included here, to your right Dr Mángano is also an author of the first important paper to come out of this new site. The team that unearthed the Marble Canyon Cambrian creatures was led by University of Cambridge geologist Simon Conway Morris and by palaeontologist Jean-Bernard Caron of the Royal Ontario Museum and the University of Toronto. They worked the shale along with at least seven others, all of whom were heli-lifted to the undisclosed location. 2014 was their first full year of excavating the 10-meter long, 3-meter high strip of exposed cliff – they found samples of 60 different species, 14 never before identified. Their paper on the Marble Canyon discoveries, published in Nature last year, is just the beginning of years and years of study that will continue to unveil the mystery of how life evolved. This entry was posted in Geology and tagged Burgess Shale, Cambrian Explosion, evolution, fossils, Hallucigenia, Marble Canyon, Metaspriggina, Simon Conway Morris, Walcott. Bookmark the permalink.